Simple patch on a puffy jacket. Not quite a perfect color match, but lots of character here. Gore-tex® pants mended after a run in with crampons. Mending refers to simple repairs like blown seams and small holes. From gloves to hiking shirts and backpacks, stitching up your simple repairs is a quick and easy way to add life to your outdoor gear. We maintain a large selection of thread colors and work to match the color of your garment or equipment for the best appearance. New velcro applied to cuffs after the original velcro failed in less than one season. 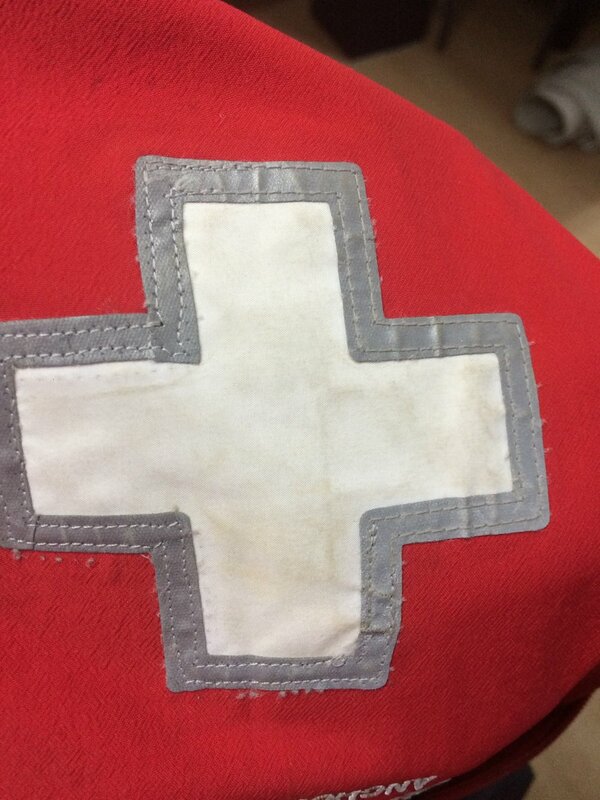 Restitching a ski patrol cross to a uniform jacket to keep Patrol looking professional. Replacing velcro tabs on jacket sleeves, or darning a hole in your packs water bottle pocket are common mending repairs that add life to your equipment at a very reasonable expense.